The Clerk’s Office and Superior Court have been expanding electronic sentencing (“eSentencing”) since 2015. Approximately two years ago, the majority of judges and commissioners in the criminal case type started issuing electronic versions of the Terms and Conditions of Probation, Order of Confinement, and Release Order documents. The Clerk and Court continued to develop and expand the use of technology in this area. More than a year ago, the Clerk’s Office began working with the Court and its IT department to assist with eliminating minute entries issued by the Clerk’s Office and replacing them with electronic sentencing orders issued by the Court directly through the Court’s next-generation case management system (iCISng). Judge Cunanan was the first judicial officer to use electronic sentencing orders in September of this year. In October, the Court expanded to most criminal assignment judges and commissioners and by the end of November, the entire criminal bench will be using eSentencing. Judicial officers issue sentencing orders through iCISng and courtroom clerks file the documents and add the distribution information through the eFile system. Attorneys and endorsed parties or entities receive an electronic copy of the sentencing orders in the same way they would receive a signed order through the eFile system, instead of receiving a minute entry issued by the courtroom clerk. The Clerk’s Office will continue to work with the Court toward further expansion and the second phase of judicial officer-created orders will be in disposition hearings. Construction projects that started in October will continue into November at the Southeast Juvenile facility in Mesa. This includes paving the main parking lot, located adjacent to Lewis Avenue. Most construction activities will take place on weekends or after normal business hours. Several surfaces will need up to 10 days after construction for the paving materials to cure. Customers at the Juvenile facility should plan extra time, as they may need to park farther from the building or follow temporary walk paths. 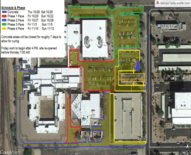 Construction is not planned at the Adult facility, however, there may be additional pedestrian and parking traffic between the two buildings through November.